Galway’s Emma Curley in possession against Bernie Breen of Kerry in the TG4 All-Ireland Ladies Football Senior Championship semi-final at St Brendan’s Park, Birr, on Saturday. 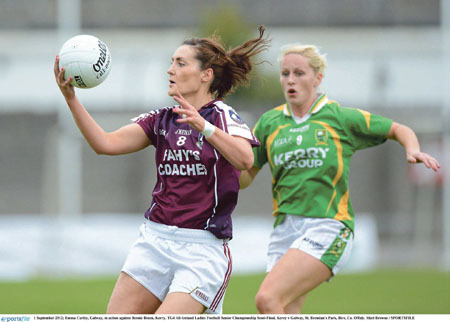 Galway’s hopes of reaching this year’s All Ireland Senior Ladies’ Football Championship final were dashed by Kerry in Birr on Sunday. The Kerry ladies ruthlessly disposed of Galway to set up a final clash with either Cork or Monaghan. The opening half was score for score. The Kingdom opened proceedings thanks to Lorraine Scanlon, but late inclusion Gillian O’Connor hit Galway’s reply. Kerry were defending and attacking in numbers, and Deirdre Corridan gave them the edge once more before Lorna Joyce replied for Galway, just after Edel Concannon missed a gilt-edged goal chance for Gabriel Naughton’s side. Kerry ace Louise Ni Mhuircheartaigh opened her account from a free to make it 0-3 0-2, but once again Galway hit back within minutes as Concannon fired over from the placed ball herself. Although Kerry had notched a number of wides, Ni Mhuircheartaigh caused Galway all sorts of problems and gave Kerry the edge again, before Concannon notched another free. However it was Ni Mhuircheartaigh again who ensured a more impressive Kerry led by 0-5 to 0-4 at the break. Galway got off to a dream start after the break when Annette Clarke fed Sinead Burke who was moved into their attack, and she squared for Concannon who made amends for her first-half miss to lash home. For the first time Galway were in the lead, but Kerry hit back with a whopping 1-6 without reply to stun Galway who had no answer for their driving style of attack. Sarah Houlihan pelted over two frees and Ni Mhuircheartaigh followed suit before Kingdom substitute Patrice Dennehy saw a rasping effort hit the post. Midway through the half Kerry found their goal when a long Bernie Breen ball found fellow midfielder Lorraine Scanlon who deflected it in with the new rules allowing the goal to stand. Two more frees from Houlihan put Kerry 1-11 to 1-4 in front before Galway finally got their first point of the half from Tracey Leonard’s free. Moments earlier Concannon had driven a goal-bound effort, but it was well blocked by Kerry keeper Edel Murphy. Caroline Kelly and Houlihan completed Kerry’s scoring before Sinead Burke and a Becky Walsh free were all the Connacht champions could muster in their first All-Ireland semi-final since 2005. Galway: L Higgins; M Coyne, S Conneally, R McPhilbin; B Hannon (B Walsh 51mins ), E Flaherty, S Burke; E Curley, A Daly; G Conneally, L Joyce, C Hehir (T Leonard 51mins ); G O’Connor (D Brennan 31mins ), A Clarke (N Duggan 57mins ), E Concannon (E Gannon 51mins ). Scorers: E Concannon 1-2, 2 frees; Lorna Joyce, Sinead Burke, Becky Walsh, Tracey Leonard and Gillian O’Connor 0-1 each. Page generated in 0.1048 seconds.